A multi-functional tool that can make a huge difference. The Res-Q-Hammer is the newest addition from the survival experts at RESQME. 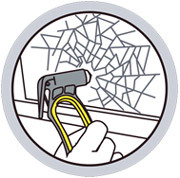 The Res-Q-Hammer is a multi-purpose tool that can cut seatbelts and breaks windows. Available with an easy-to-install bracket, the Res-Q-Hammer can be mounted in your car and always on hand. 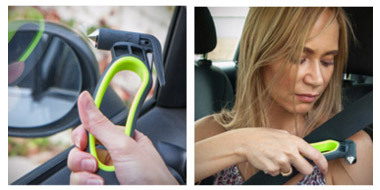 A car accident is something we all hope will never happen to us or a loved one, but it is best to be prepared for the worst, and the Res-Q-Hammer goes a long way in making you feel safe. The Res-Q-Hammer is the next evolution of their number one bestseller, the Life Hammer. The Res-Q-Hammer’s body is shaped like a handle and has a more modern and ergonomic design, giving you more leverage in case of emergency. This also cuts down on the possibility that the Res-Q-Hammer will slip from your hands. The pointed steel point at the top of the Res-Q-Hammer will shatter any glass quickly and efficiently, allowing you to move on to the next window, or to escape the car faster. On the other side of the steel-point, as their sharpened blade, used for cutting seatbelts. The blade is safely tucked under a piece of hard plastic, only allowing a seatbelt to be cut; you won’t have to worry about whether or not you’ll hurt yourself even more. At the bottom of the Res-Q-Hammer is an opening that gives you the option of snapping your Res-Q-Me Keychain in. Either tool goes a long way in providing you the best case survival should an accident occur. Perfect as a gift for a new driver, or even just a gift for a loved one, the Res-Q-Hammer brings huge peace of mind. You would never want to find yourself in a situation that requires a Res-Q-Hammer and not have one. 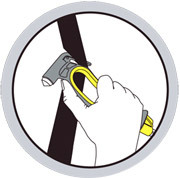 Make your safety a priority and always have a Res-Q-Hammer in your car and on hand.